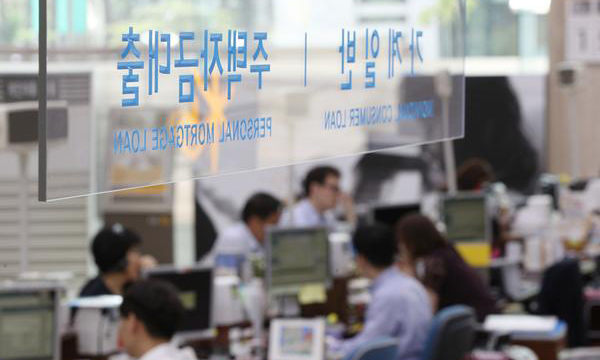 South Korean banks’ household lending rates dropped to their one-year lowest in December amid growing uncertainties in the economy that weighed on long-term market rates despite a policy rate hike in November. According to Bank of Korea data on Thursday, bank lending rates on new household loans in December averaged at 3.61 percent, down 0.02 percentage point from a month earlier, the lowest since December, 2017 with matching number. The rate dropped for a second consecutive month last month. The rate fall came despite the central bank’s policy rate hike from 1.50 percent to 1.75 percent in November. Industry watchers noted a drop in long-term market rates that are key indicators of household lending rates such as AAA-rated bank bonds with three-year and five-year maturity attributed to lending rates. Also, long-term market rates tend to be closely linked to economic outlook, unlike short-term market rates that respond more to a policy rate hike. An unnamed official from the BOK said that long-term market rates fell due to economic uncertainties despite policy rate hike. The rates will go up when concerns ease over the economy. BOK data showed that banks’ lending rates for home-backed mortgages stood at 3.19 percent in December, down 0.09 percentage point from the previous month and the lowest since February, 2017, with 3.19 percent. The rates for collective loans also dropped 0.07 percentage point to 3.23 percent during the same period, marking the lowest since September, 2017, with 3.22 percent. The rates for credit loans that are linked to short-term market rates, meanwhile, rose 0.08 percentage point to 4.64 percent in December, the highest since March, 2015, with 4.75 percent.